Jimmy Choo presents us with her beautiful line of bridal shoes, the Bridal Collection 2012 which proposes a series of extraordinary models to make it even more beautiful than the most important day of your life. In the purest tradition of the brand, the style of Jimmy Choo and his ability to roam between different shapes and decorative motifs are both and the result is a line that rewards mostly white, but also aims to impress by adding to the mix glitter prints details and eccentric, for fashionistas who love a more extravagant style. Let's take a look together to the new collection. 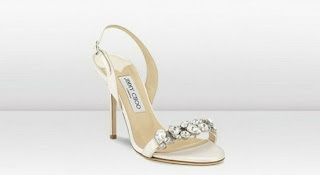 In his line of pumps and Jimmy Choo has added decolletes beautiful models, such as the peep-toe Gloss made of silk with curl at the tip and along the heel, to mimic the shape of a flower (the price at the online store is 620 euros) , model designed in a version with transparent lace on the toe and heel covered with 12 cm (645 euros). More in classical form Atom are the pumps, peep-toe high heel and platform 9 cm by 1 cm, made of ivory satin (525 euros), while the Nova takes up the shape by adding a more comfortable adjustable slingback with Swarovski. The romantic and Isabel have medium heel of 6.5 cm and are designed in ivory satin, while the delicious Lockett must have the advantage of the period, that of decolletes a narrow point. Were 8.5 and upper heel ivory silk (345 euros). In the line of bridal shoes are the most unique gems of the collection. We start with the Fairy model, the most eccentric with her stiletto heel 14.5 cm high well balanced with the front plateau. Fairy is designed with lists woven silk and closed with buckle strap with Swarovski (750 euros), while the Lotus has tip-toe with open list covered with large and clear crystals, 10 and slingback heel behind the heel (595 euros). More sober models Macy (525 euros) and India (345 euros), but always beautiful. As I said, Jimmy Choo and daring in this case it does enter the Bridal Collection also models of shoes with glitter finish really special shoes on high heels, medium high or very high, and all very interesting. We find in the collection of reinterpretations of classic lines of Jimmy Choo, the peep-toe heels with Life 15 (550 euros), the Vamp adored by celebrities (550 euros), through to sophisticated Private (695 euros) and the beautiful mary jane Lace with heel 10 (375 euros). I wish I could own these beautiful heels.